The apartment is 400 square feet and is above our garage. It was completed in March of 2015, so it is very new! The views are incredible from every window. You can see all the way to the bay area on one side, vineyards to another and finally, a working farm, complete with cows, turkeys, sheep, horses chickens, dogs and cats on another side. The apartment has a full kitchen, full bath, and a living room. There is a fold out couch in the living room as well as a queen sized bed in the bedroom. There is a partial wall separating the bedroom from the living area. Quiet hours are 10PM-7AM, as we love our neighbors! The maximum amount of guests is 4 and the vehicle limit is 3. It is situated on one of the more popular bike routes in the Sonoma/Napa area and is walking distance to a Ceja Winery, Homewood Winery, Hanson Vodka and Carneros Brewery. There are a handful of wineries just minutes away and the town of Sonoma is just three miles away. The city of Napa, another popular wine country destination is just 15 minutes away. The home is situated on a quiet road surrounded by vineyards, and other small family farms. It is a two and a half acre lot, with no homes close by. Our neighbors include horses, sheep, cows and goats. We also have horses ,sheep, chickens and turkeys and a steer. Yes, the roosters do crow in the morning, so we will provide ear plugs. Our home offers a unique country experience, while you enjoy all the wine country has to offer. We have organic flower gardens, vegetable gardens, and an organic orchard. Just jump on your bike and ride. Please see Sonoma Valley Visitors Center for local events. Also, Homewood Winery, Carneros Brewery and Fremont Diner are within walking distance. January- Lambs are born. The garden has broccoli, chard, and kale. February- Fruit trees in bloom, lambs in the fields. The olive festival is in full swing. March- Mustard in the vineyards and chicks begin to hatch. April- Spring garden goes in. Lettuce and peas in the garden. Hens begin to lay large quantities.Heritage turkey poults arrive. Sonoma Film Festival takes place. May- Turkeys leave the barn to their outdoor digs. Early crops begin to mature. June- Squash, lettuce, beans, basil, and herbs are ready to harvest. July- Early tomatoes, beans, beets, celery, carrots, potatoes are ready to harvest. Hens continue to lay. The Sonoma home town 4th of July parade is adorable and entertaining. The Catalan Festival at Gloria Ferrer is a fun event! We are on the course of the Napa/Sonoma half marathon. August- Garden is pumping veggies and herbs- corn and eggplant are finally ready. Fruit is producing as well. September- Heritage turkeys are lovely with their large tail feathers and silly antics. Garden continues to flourish. The Harvest Festival and parade happen at the end of the month. October- Lovely fall colors grace the vineyards and orchards. The summer garden wanes and the winter garden goes in. The weather is usually fabulous and the valley is ablaze with color. Many harvest celebrations are offered. November- Fall colors continue and the hens slow down. Persimmons, pomegranates, and apples are still waiting to be picked. Holiday in Carneros takes place. December-Hens take a break, vine shed their leaves, and everything rests, waiting to begin the cycle again. Please ask us about mid-week and off season rates. My husband is a retired police officer, our daughter is 16 years old and very involved in 4-H and FFA and I am an elementary school teacher. We moved to Sonoma 17 years ago to be closer to family. We love the area and the people. There is never a dull moment and we are very close to San Francisco if you want something more. We enjoy our animals and gardens, and grow /produce a large portion of what we eat. We camp often, and also do home exchanges and enjoy seeing different parts of the world. The peace and quiet. We are off the beaten path, so we get very little traffic. It is a great place to unwind and relax. We are located on the most popular bike route in the Sonoma/Napa area. Picking broccoli one minute and eating it ten minutes later is pretty cool. People say our eggs are the best they have ever had. We walk, ride our horses and bikes all around the neighborhood. It is very calming here. It is well located for trips to both Napa (fifteen minutes) and Sonoma (ten minutes).We are fortunate to be about a quarter of a mile, a short walk, away from Fremont Diner, Carneros Brewery and Homewood Winery. Downtown Sonoma is a lovely place to visit. There is something for everybody. There is a tree filled plaza and park for picnics and relaxing. We also have unique shops and small wineries. You can be in Dillion Beach in less than an hour- Bodega Bay is about an hour away and the drive to both beaches is incredible! Situated in the Carneros region of Sonoma. If you are staying more than two days, you are welcome to use our washer and dryer. Great stay, wonderful location. Eileen was very nice and accommodating! We loved farm and fresh eggs! Convenient and economical lodging for visiting wine country. Eileen, the owner, was attentive with providing farm fresh eggs for our breakfast each day. That was indeed a special treat. The accommodations were comfortable and we had everything we needed for our stay. There were a couple things we feel could be improved upon. Although we understood we were staying at a working farm, we were a bit disappointed with all the clutter about the grounds - not quite as picturesque as we thought it might be. The rental itself, lacked a deep cleaning one would expect when paying for hospitality lodging. Aside from those two things, we found our stay to be charming, memorable and look forward to a return to wine country! The location of this VRBO was very close to restaurants and wineries. We especially enjoyed the farm atmosphere. Fresh eggs and organic jam were fabulous. Our hosts were attentive and quick to respond to our messages. Charming / Homey / Comfortable! Highly recommend! My fiancée and I thoroughly enjoyed our stay at Pharo Farms! Our favorite part of the stay was how accommodating and committed the Pharos were to making sure we had everything we needed and were very comfortable. Rich (retired police officer) does Napa/Sonoma guided tours. He even gave us a discount since we were staying at their property - we had a fantastic time. Check-in & check-out are very simple. 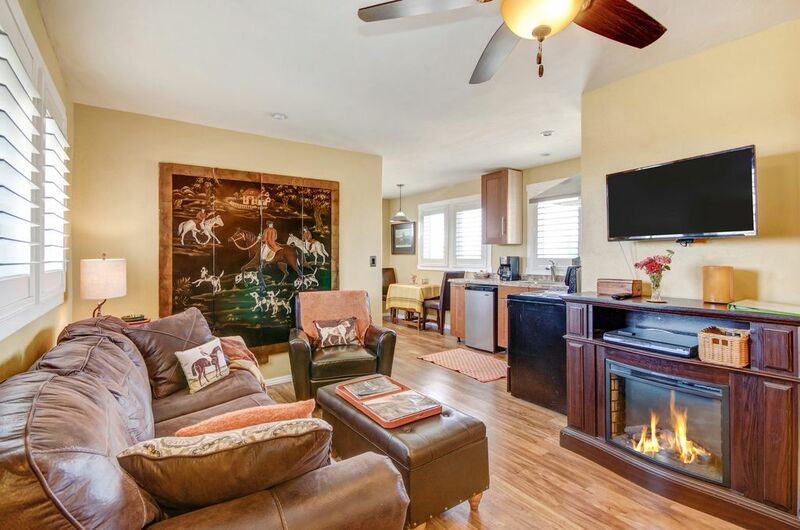 The property is centrally located between Napa & Sonoma so both towns are easily accessible. The kitchen has all appliances and cooking utensils readily available if you want to eat in. Although we brought everything we needed, the place is connected to the Pharos house and they made it very clear to us that we were more than welcome to anything we needed. Very nice ppl. Highly recommend!! Quiet rustic atmosphere with a very comfortable unit that had everything we were looking for.. Very convenient location for visiting both Sonoma and Napa. Really enjoyed our stay. It was my friends 60th birthday so it was a girls weekend. Everything is local and easy to get to. The unit is fully stocked and even had fresh eggs, bread, butter, creamer and coffee/tea. I forgot my tooth brush and they even had a spare. At night you fall asleep to frogs and wake up to roosters singing good morning. The sheep are super friendly and the views are amazing. We will definitely keep this place in our list of travels!! Every night we fell asleep to the sound of frogs and at in the AM we heard the roosters telling us good morning. While Sonoma is a lovely town with a variety of wonderful activities, we highly encourage all that visit this area to take advantage of the proximity to Point Reyes National Seashore. The scenery is spectacular and on a given day you can view falcons, eagles, elephant seals , fox, Tule Elk, deer, whales, seals, coyotes and even river otters!